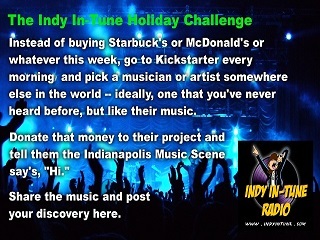 Okay, folks, we're nearing the end of the first week of the Indy In-Tune Holiday challenge, and I have to say, this whole "giving spirit" thing has been an absolute blast. When I think back to nine years ago or so when Indy In-Tune was a fermenting idea in my alcohol-soaked skull, one of the things that made it really appealing was the chance to meet new people, make a few friends, and hear some great music. What I've come to realize in the years since then is that ... well ... I've met all you people. This has been a real chance to connect with a few artists regionally, nationally, and internationally in order to spread the word that Indianapolis has a unified music scene, and we support our musical peers everywhere. Just to recap, I previously posted about how all this got accidentally started. What I haven't done is get everyone updated as to how it's going. So, first off, let me say a big thank you to everyone who embraced, ran away with, or at least helped spread the word about this idea. Quite a few of you jumped on it -- not as many as I had hoped -- but I think everyone "gets" what we're trying to do here. Since it really was an impromptu idea on a Monday night, and not really announced until Tuesday, I know everyone kinda feels like it was sprung on them at the spur of the moment, so hopefully we can pull some more into the fold for a second week. Next, I had no idea this would become really friggin' addictive. I've had so much fun with this, and since not everything I've backed looks like it's going to get funded, I'm going to keep it going for at least another week, and maybe through the holiday itself. So, I invite everyone to jump in, even if it's just two or three bucks sporadically over the next few weeks. Honestly, it's all about the people, not so much the dollar amounts. You'll meet some very cool musicians who are thrilled that their music was heard by a stranger, and you'll gain a lot of paid-forward karma points if you're into such things. Day 1: Bam Morgan's Debut E.P. : As previously mentioned, this is kinda where it started. Just decided to be nice and throw some bucks at a project based on a recommendation from a friend of mine over in England. Felt so good about it, I figured everyone needed to experience the joy of a random act of kindness, and so the idea was born. Day 2: Captain Chaos "Shadows of Order" LP: So in scanning through projects to back, I found this guy down in Bloomington, whom I had never heard of -- which I thought was weird in and of itself. He didn't have a video or sample of his music, but the name (evoking Cannonball Run, intentionally or not), and the mention of ukulele, punk rock, and boxed set in the description meant I had to back it just to see what the hell it was. Day 3: Johanna Jingnert's Debut EP: I decided it really didn't do this to only back local and regional acts, so I went as far out of my way as I could to find the next project. Sweden was about as far away as I could get without learning a foreign language to see what I was backing. Johana and her band had a very cool introductory video and some great music that I was digging -- very pop-centered, which I've often lamented we're missing here in Indiana. I also like the fact that my lunch money converted to 100 Krona at the current exchange rate, which made me fell like a big shot throwing around numbers with multiple zeros at the end. Day 4: Chakras EP w/ Producers Joe Chiccarelli & Ryan Siegel: Here's one of those cases where I realize I would be a very bad scout for a record label, because I love everything and want to make everyone succeed. I had already lined up Day 4 and Day 5 on Wednesday night when I got messages from two other challenge-takers asking why I didn't back Chakras' Kickstarter, which only had a little over a day to go. Chakras, after all, are frequent visitors to Indy, their music is in rotation on Indy In-Tune, and I've met most of them personally. Okay, truth was, I didn't know they had a Kickstarter; it must have gotten buried in the list. So, of course I jumped on it, and moved Bands #4 and #5 to be #5 and #6 -- Hey, looks like we're going to have a Week 2 now! Day 5: John Kruth and the Drunken Wind of Life: Still looking for something a bit off-kilter and came across this project. Again, you should have a cool video that tells a cool story if you want to get your Kickstarter funded by strangers like me! John is an NYC-based singer/songwriter who is working on an album of his music set to the words of Croatian poet Tin Ujevic. Now, I love poetry, I love the title "Drunken Wind of Life," and I especially love that he's looking to get former members of the Violent Femmes and Camper Van Beethoven together on this project. Day 6: Earwig - Pause for the Jets: Did you ever hear of a great band coming to Indy from Columbus, OH? It just doesn't happen. I remember when I first started doing Indy In-Tune, there was a sister podcast called "Constant Columbus" run by Kevin and Dorn, whom I spoke to a few times. 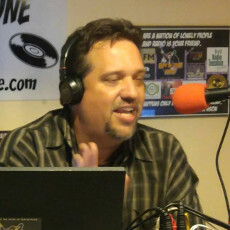 Their whole premise for the podcast was to help drum up support for a dying local music scene. Honestly, I don't know almost a decade later if it worked or if the scene is still dying, but if these guys are any indication, they have some killer bands that we need to get on a bill over here. So that's where we are. How did you guys do? What did you find that you had to get behind? Who's up for another week? I know I am.